I live in Toronto, zone 7a. 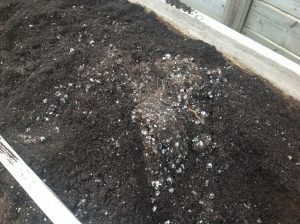 When turning the soil in our home made square foot container box last week, I found something that appears to be white mould in large quantities. I have been gardening for many years, but have never seen anything like it. We also found numerous wireworms. The soil in the containers was a mix of 1/3 of each vermiculite, peat moss and compost, which has been in place for 5 years. Thinking it may be time to replace the soil or rotate crops but welcome any recommendation you could provide. White mold is caused by several species of the fungus Sclerotinia that overwinter in dead plant material and infect the soil. The bad news is that it can survive for several years. During periods of cool, wet weather the mold establishes itself. Last summer and this winter were particularly wet and cool. Spores are dispersed primarily by wind, but also by rainsplash and insects. These spores can have a detrimental affect on any plant in your container. Infection often begins on dead or decaying plant parts like flowers and leaves, and then spreads to healthy tissue. The safest course of action for you to take would be to totally replace the soil in the same ratio you previously used. To lessen the chance of this happening again make sure that your container box has good drainage. Do not over water and in the Fall remove any plant debris from the container, including roots.